There has been a lot of attention on ALSDEAD since they lost their drummer back in January. New drummer, NIKKY (ex. 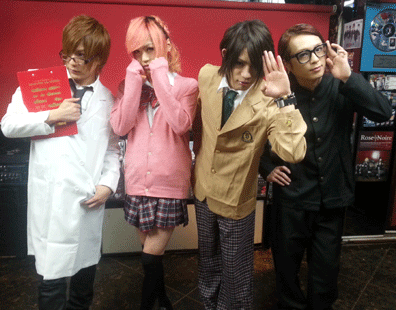 GALYED), joined them on stage at their JUDGEMENT DAY event performance on May 17 for their first live as the new ALSDEAD. On their official website, they have released new pictures of NIKKY as well as announced the release of an original album in the fall. With the addition of NIKKY, their new single, STARLESS (to be released on June 4), fuses their original intensity with a new earnestness to create a sound even better than before. The SPOT PV has already been released online so you should definitely check it out for yourselves. Keep an eye out for ALSDEAD at the start line to a new beginning. I’m Nikky, the new member of ALSDEAD. I’m really excited to produce amazing things as a part of this band. Thank you for your enthusiastic support for the rebirth of ALSDEAD. ・Access via radiko from within the Aichi, Gifu, and Mie Prefectures.